Join over 90,000 people who are using our themes. 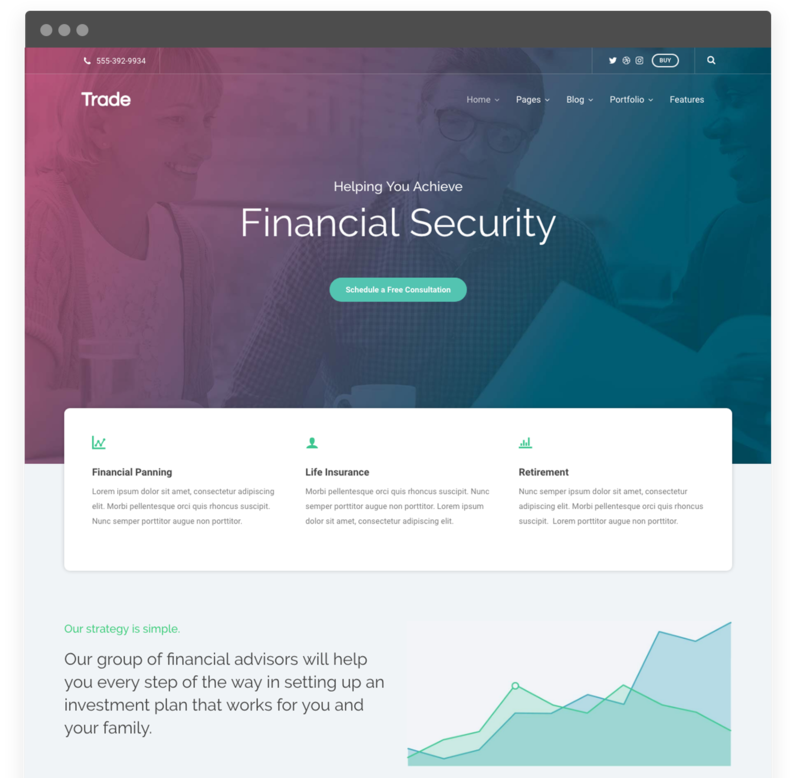 Trade is a stunning premium WordPress theme that integrates seamlessly with Page Builder. Use the intuitive drag-and-drop interface to build your pages the way you want. With the click of a button, import all of the demo content, allowing you to get a jump start on building your business website. We use a minimalistic approach to theme design, insuring your site will look fresh and modern for years to come. All of our premium WordPress themes are fully responsive, meaning your site will look great on mobile devices and desktops. Browse our extensive knowledgebase, or if you have questions, our friendly support team is here to help. "I used a premium WordPress theme from ThemeTrust to create a site that showcases my creative work in advertising. The theme is perfect for my purpose. It's simple, elegant, functional and puts the spotlight on my work rather than drawing attention to itself. I'm really happy with the whole experience!" We have the perfect WordPress theme for your site. You probably have a few questions. If you're here, chances are you have at least heard of WordPress. But perhaps you're still not quite sure what it is or what it does. WordPress is a free open source content management system. In plain English, it is an online tool that makes creating a website very easy. WordPress is the fastest growing CMS. Nearly 500+ new websites are built with WordPress every day and it powers over 10 million websites. To get started with a WordPress site, the first thing you need is hosting. There are plenty of web hosts out there, but they are not all created equal. We recommend SiteGround and Kinsta. Both of these offer a one click WordPress setup, making it easy to get your WordPress website up and running. We've written a review on Kinsta and a tutorial on how to start a blog on SiteGround. A WordPress Theme is a collection of files that work together to produce a graphical interface with an underlying unifying design for a website. That's the official definition from the WordPress.org site, but you probably want the non-geek definition. Basically, a WordPress theme makes your site look amazing. That is if it is a theme like one of ours. A theme uses styles and templates to present your content in an aesthetic way. Themes can also give you tools and settings for customizing the look and feel of your site. Our themes do all of the above, and much more.